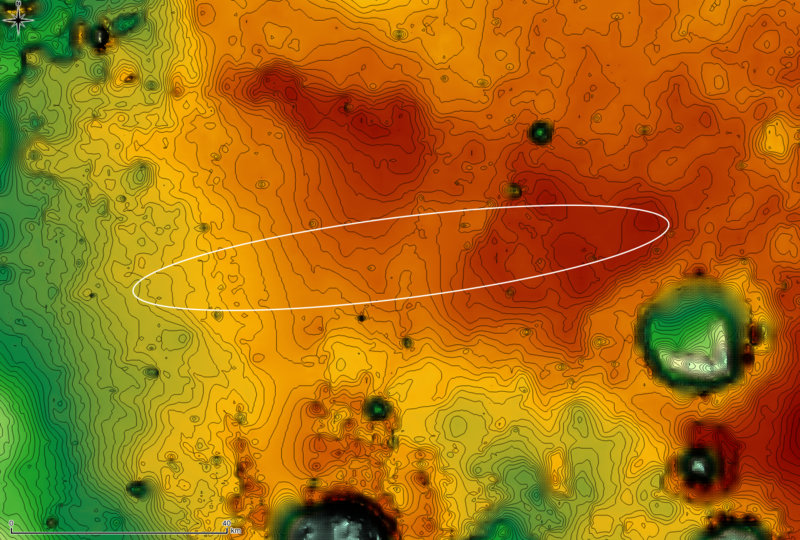 The ExoMars 2016 entry, descent, and landing demonstrator module, also known as Schiaparelli, will touch down on Meridiani Planum, a relatively smooth, flat region on Mars, on 19 October 2016. The landing is targeted to take place within the solid ellipse marked on this topographical map. The ellipse, centred at 6° West and 2° South, measures about 100 km East-West and 15 km North-South, and is valid for a launch on 14 March. The near-equatorial landing site is North-West from the current location of NASA's Opportunity rover. One of the reasons for choosing this landing site was because of its relatively low elevation, which means that there is a sufficient thickness of atmosphere to allow Schiaparelli's heat shield to reduce the module's velocity and get ready to deploy its parachute. The final firing of its thrusters will ensure a soft and controlled landing. The lowest areas on this map are shown in green, while the highest areas are dark brown. The large crater on the right (East) of the image is Endeavour, which is about 22 km in diameter. Opportunity has been studying its western rim since 2011.